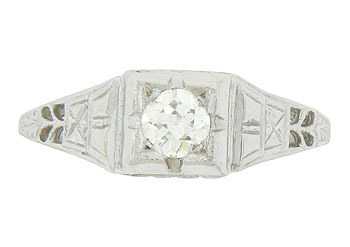 The face of this bold antique engagement ring is subtly elevated and engraved with abstract organic decoration. A dazzling .25 carat, H color, Si1 clarity round cut diamond glows from the center. 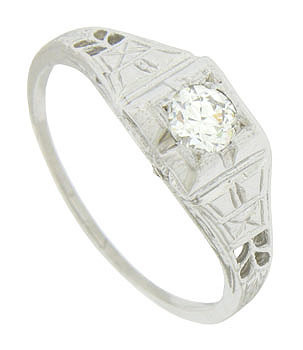 Organic cutwork and additional engraving cover the sides of the ring. 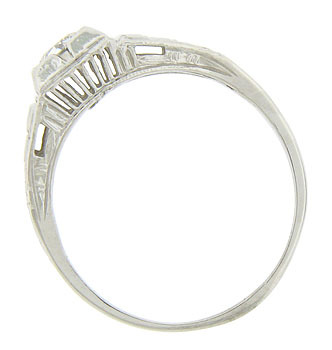 The Art Deco ring is crafted of 14K white gold and measures 6.33 mm in width. Circa: 1930. Size 6 1/2. We can re-size.